Welcome to TasWater's online engagement hub! This is a place for you to provide your thoughts and ideas on a range of TasWater projects and activities. To participate, just click on any of the current projects listed on the right. We encourage you to register with Yoursay - TasWater, so you can be part of the conversation! This update on the status of the Waratah Dam in the state’s northwest follows a community meeting on the 13th of February this year. The community meeting was well attended, and we provided an update on our position in relation to the dam and the outcome of the Expressions of Interest (EOI) process. This update also addresses a range of important issues raised by community members at the meeting, and our intended course of action over the coming months. The Kangaroo Bay Rising Main takes sewage from the Wentworth Park pump station to the Rosny Sewerage Treatment Plant. It is an important piece of infrastructure, however, it is in need of replacement given it has failed twice in 2017. TasWater is currently making a decision about the best pipeline route, with assistance from our consultants, JMG, and input from the community. We are aiming to have a decision by the end of March 2018. Repair of the Swansea Dam is scheduled for completion by Spring 2018, weather permitting. 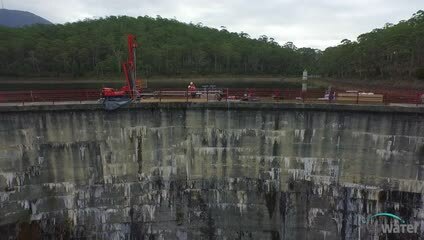 TasWater has temporarily turned off the dam's connection to the Swan River and is allowing the dam to slowly empty as its water is consumed, so repairs can proceed. TasWater's number one priority is maintaining the security of Swansea's water supply throughout the process. TasWater is undertaking further works at the Ti Tree Bend Sewage Treatment Plant (STP). In December 2016 we cleaned out Digester No. 1 to ensure the effective treatment of sewage at the plant. We now intend to clean Digester No. 2 during November and December. The digesters play a critical role in the sewage treatment process, treating the solids collected and producing a by-product that it suitable for re-use. TasWater’s water meter renewal team is rolling out a state-wide program to install new, second generation meters into customer properties across Tasmania. Renewal works will roll around the state and are anticipated to run until 2019. TasWater has around 40,000 meters that are over six years old and this program will see these meters replaced. The aim at the end of this program is that our 20-40mm water meter fleet will not be older than 2011. TasWater will be installing second generation meters that use the latest technology and meet the latest Australian standards. They also detect lower flow rates than older meters, which will help with leak detection on private property, if necessary. TasWater rolled out first generation meters with its renewal program that started in 2011. This next renewal program moves us to the next generation of meters. All mechanical meters currently in operation around the state are more prone to decay than the newer electronic models. Second generation meters can be read remotely along with our first generation meters, significantly reducing the time and resources required for meter reading. It also means TasWater staff will not need to access private property as often. They are more sensitive to lower flow rates, which can help detect leaks within private plumbing. Part of this program also involves replacing older water meter boxes that contain asbestos. These asbestos boxes will be replaced with new, standard meter boxes by specialist crews working with TasWater. The specialist contractor will be using appropriate protective equipment to conduct this work ahead of meter installation and the area around the water meter will be fully fenced for safety. TasWater is taking steps to address odour issues at Smithton with the removal of thousands of tonnes of anaerobic sludge. Work will commence in August 2017 and will take approximately 10 months. TasWater is upgrading the existing Blackmans Bay Sewage Treatment Plant (STP) as part of the overall Kingborough Sewerage Upgrade Project. This existing STP has been operating for 30 years and is nearing the end of its service life. An upgrade will improve its environmental performance, bringing it in line with modern standards and allowing TasWater to enhance the Kingborough sewerage system. The upgraded Blackmans Bay STP will offer a significant improvement in odour and noise in comparison to the existing STP, and increase capacity to treat a higher volume of sewage to a better quality with more reliability – accommodating future growth in Kingborough. As a result of TasWater’s ongoing preparation of the Development Proposal and Environmental Management Plan (DPEMP) our environmental studies have determined that no significant impacts are expected and that the approvals process will remain at a state and local government level, rather than requiring Commonwealth approval. For more information go to the project page here. How do I participate in online engagement? I don't really like using the internet, will I lose out on having my say?